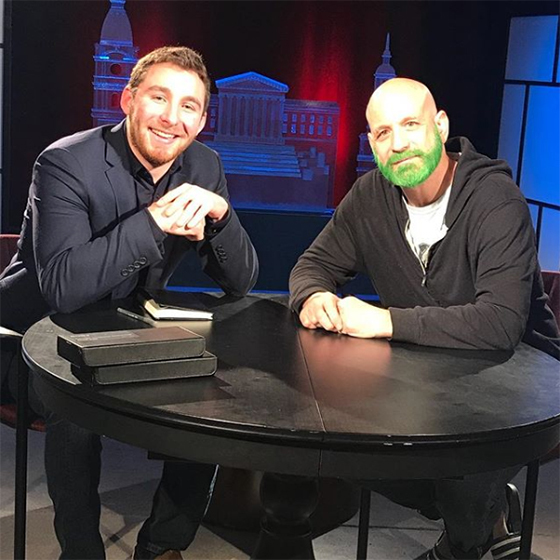 Award-winning chef and restauranteur Marc Vetri visits the set of Philly Famous Podcast to talk to host Greg Holdsman about his career and his approach to cooking. Vetri, sporting a dyed green beard in support of the Eagles, just opened a restaurant in Las Vegas, Vetri Cucina Las Vegas after having sold his restaurant group, including Amis, Osteria, Alla Spina, Pizzeria Vetri, and LoSpiedo (now Bar Amis), to Urban Outfitters a few years ago. He emphasizes that he strives to exhibit the best in hospitality in his establishments, above just the food and the ambiance. He also discusses the Vetri Foundation, which aims to provide children with positive fresh food experiences to promote health and counteract obesity through cooking classes and experimental programs. Watch the premiere this all-new episode of Philly Famous Podcast on TUTV this coming Wednesday, February 13 at 1 and 9 p.m.